This was a first go at a test model for the Martians. I don’t know quite why, but the clear dome looks endlessly cool on a model. At least, it does to me. The only place I can think of in the wargaming world that did this before en masse was Bob Naismith’s old Cobalt Marines, and I only ever saw them in pictures. Looked fun though. The model has since been tweaked to get to the following 3D render. As you can see, we’re going for a bit bigger than the 15mm we originally discussed for this project. Well, maybe you can’t see as there are no size comparisons. Either way, you can take my word for it. These aren’t 15mils. 36 Responses to A Bigger Mars Attacks! I’ll be keen to see what rules you come up with, but as for the models .. I don’t like them at all. They’re pretty faithful to the card art, which is what the license is based on. Being a license you don’t really have much wriggle room in the visual sense. I think they do a grand job of being Mars Attacks Martians. However, that won’t suit everyone’s taste. I don’t know the final contents yet, and I don’t know what you rate as good value. However, value for money is a core aim of Mantic in general, and I don’t see why this would be any different from all the rest of their stuff. I will, as ever, be trying to squeeze in a load of replayability into this so you get as many hours of fun out of it as possible. I understand why you can’t game with it but I like the original mini. I’ve a fondness for 50’s Weird Science-style sci-fi and that mini could be the basis of a nice diorama. I don’t think there is really much difference, in reality. I’ve found that for me at least, grey renders always look blobby compared to the final result when you have it in front of you. Not sure why that would be. Things like the Enforcers, for example, are far finer in the flesh than they look on screen. They looked awesome at Gen Con… I was really impressed! It’s the bubble helmet that really sells the model for me. My only concern is how they will attach to the rest of the model. Back in a day, I had a few Airfix models that ended up with ‘steamy’ windows due to issues with glue. If it can slot into place it shouldn’t be too bad. I guess I’ll just have to buy some extras that I can experiment on first. Slotting in is being looked at. It’s a case of trading off a number of desired features to get the best overall end result. AT43 Karmans had white glue on their helmets. It was easy to unglue with hot water to repaint the faces, for example. Is there any hope that the helmet can be “Vac-Formed”. This would realy make the head clear and cool. Last I heard they were exploring the different options for both the model and dome. There are pros and cons for the different options. Some are easier to assemble, while others might have slightly sharper detail. It’s always this sort of balancing act. Wow, I was impressed with the detail when I saw the pics on BoW the other day and I thought they were 28mm! I’m really impressed with how much detail they’ve got on such a small mini. They are 28-30mm size. Not sure exactly what the final height will be to the last mil. Glad to hear they’re approximately 28mm as that is by far my favourite scale for detail and ease of painting vs not be too expensive to have armies of them. The Mars Attacks game was originally going to be in 15mm, but is now going to be in 28/32mm (or whatever the cool kids are calling that scale these days). The only mention of 3-ups that I’ve noticed was in reference to an old Kings of War model that the test of the Martian was standing next to. Nothing to do with the MA project itself. Also, the function of 3-ups is to produce a large model to be pantographed down into a steel mould for plastic manufacture. It is part of a manufacturing process that is entirely scale agnostic. It’s done the same whether you are working in 6 mil or 54. Shall I give you my money now? Or wait until October? just wondering, what other factions will be in the game besides the martians and army men? There are several other factions including Novas Virae (which I always spell wrong) and the Martian Science Division. Actually, there are a bunch more factions who could turn up, it really just depends on how well it goes. Ok. I asked because the hosts of the d6 generation podcast have a theory that a game only becomes playable/popular when there are at least 4 factions. do you find this is true when you’re designing a game system? I’ve heard that theory from a few sources, but then I’ve also played a great many really good historical games where there were only 2 sides. You can’t really add Japanese or Russians to a Battle of the Bulge game. Even the Brits only turn up right at the end. It’s a good topic for a much longer post. Jake, I would be interested to hear your thoughts on this especially as there have been a few concerns raised at my local club about there only being two factions. There are a lot more than 2 factions in the background and we’ll be using as many as we get a chance to develop. It makes sense to start with the iconic Martian invaders and US Army, but that’s just the beginning. The Novas Vira are important influences in the backstory we’ve developed, so they should come along pretty soon, and the Martians are not nearly as homogenous as you might at first imagine. There are power struggles going on within the MArtian political structure which ends up with several groups (with rather different kit) fighting against each other as well as the Earthlings. Like I said above, it really only depends on how well the Kickstarter goes. The now out of production Karman Yets from AT-43 had a well done bubble helmet. Oh, and the “Invasion From Outer Space” aliens from Flying Frog do as well. Cool. I know the Karman, but haven’t seen the Flying Frog ones. These are still WIP, and as I said above what they actually look like in the real world always seems to be very different from the renders. One thing I have noticed is that if you take the picture into Photoshop or Gimp and replace the dark grey background with white they look much thinner limbed. Aha. Score one for optical illusion shennaniganery. One thing that does particularly concern me is the helmet; when you have a rim like that (the sharp change in angle on the dome) you get a ‘line’ effect where the material refracts. The render is set not to refract (or indeed from the looks of it include the inner surface of the dome). Both things that absolutely need to be borne in mind before it goes to production. The thicker the piece, the greater the total distortion. The helmet I made is out of sheet acetate, extremely thin indeed (and a lower refractive index than styrene or perspex). I really do think a smoother curve is what’s gonna be required. Pingback: Mantic’s Mars Attacks Gets Bigger! 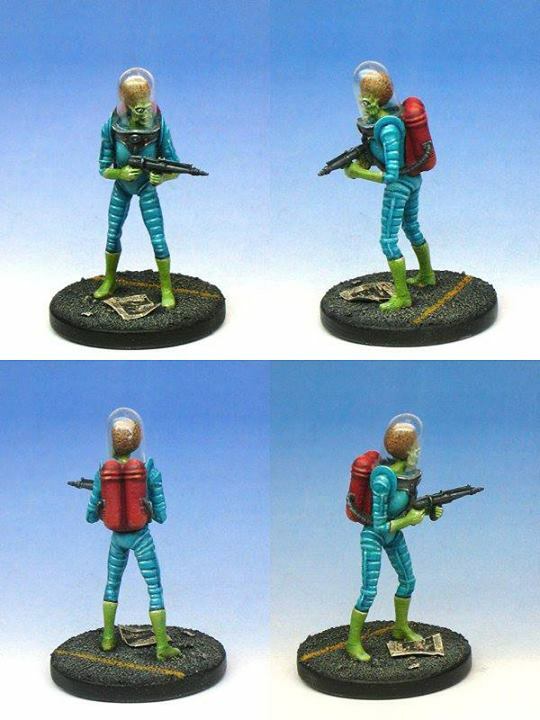 I’ve painted up a few of the Flying Frog Martians as Mars Attacks Martians for their board game they come close but purposely lack a lot of the details of the license. I can only say I really look forward to the official ones since I love the B movie feeling of the movie and cards. I like the slightly chunkier look of the revised version. I hope the brain detail has been exagerated a bit so it takes a wash nicely. The painted example seemed to have too fine detail on the brain it comes across more like noise than squigly brain detail. So very glad you guys switched to 28mm. Any chance of a sneak peek at dat crunch? I need some rules in my life.